Hampden was transformed into an athletics arena for summer 2014. Scottish FA chief executive Stewart Regan said Glasgow will meet all Uefa requirements should Hampden be chosen as a host city for Euro 2020. Glasgow will find out if it is one of the 13 host cities in Geneva on Friday. But concerns were raised about the commercial aspect of Scotland's bid which Uefa described as "inadequate". "We've made it absolutely clear to Uefa that as far as the bid's concerned all requirements that they've outlined will be met in full," said Regan. Nineteen national associations have submitted bids, with 13 host cities designated for either the Finals Package or Standard Package, which includes a quarter-final or round of 16 fixture. Hampden's bid received backing from former Manchester United manager Sir Alex Ferguson, and Regan is hoping the stadium's long history of hosting big sporting events, including last month's Commonwealth Games, will be significant. "This is the 60th anniversary of the European Championships and for us it's all about history," Regan told the Scottish FA website. "Hampden has huge history and heritage, it has staged some of the most momentous matches in international football as well as club football and that's what we're playing on. Undoubtedly Glasgow is now on the global map having delivered a fantastic Commonwealth Games. "We're playing on Zinedine Zidane's goal here at Hampden, we're playing on the fact Glasgow and the West of Scotland cricket ground played host to the first ever international football match between England and Scotland back in 1872." 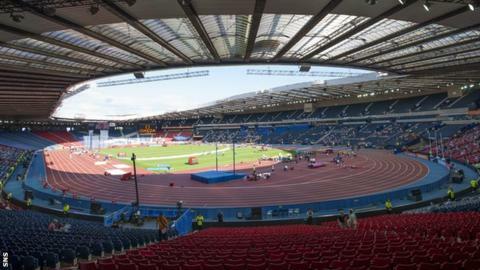 The Commonwealth Games drew wide praise from around the world, and the Scottish FA are confident the successful staging of Glasgow 2014 has strengthened their bid. "It's been huge," Regan said. "Undoubtedly Glasgow is now on the global map having delivered a fantastic Commonwealth Games, and I think the organisers of Glasgow 2014 and the city should be incredibly proud of what they've achieved. "The amount of people that visited the city and the positive feel good factor people had has made a big impression, and we're hoping that has rubbed off both on Uefa and Exco members and that will go in our favour."